A terrific movie that is sad, powerful, and even intense as a dad finds himself as the single parent fighting for his kid. Kramer Vs Kramer is a pretty great movie. It’s about a father who is totally career oriented and has to deal with his wife leaving not only him, but also their son. The father, Ted (Dustin Hoffman), now has to learn a whole new way of life as he begins to put his son, billy, ahead of everything else. the first half of the movie is about how Ted changes and learns to be a better father. The second half is about the mother , Joanna, coming back and wanting to take her son away. She‘s played by Meryl Streep, and has made up her mind that she wants Billy back. The result is a powerful trial where dark secrets end up coming out. This movie is incredibly interesting. Dustin Hoffman is on top of his game, battling not only for Billy, but also to save his own career. There’s a lot going on in this film, and all of it is gripping and intense. What a cool movie. 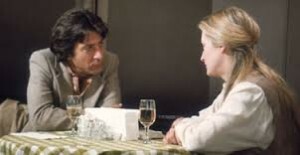 Kramer vs. Kramer is an emotional and yet funny movie about a father who was always too busy for his wife and son, and now finds he being a single parent. That premise makes it sound like the ultimate cliché, like the Ben Affleck movie, Jersey Girl, or something, where the father learns to be a good parent during the course of the film. This movie is hardly that at all. Instead, the main character, ted (Dustin Hoffman) always seems like a pretty good guy to us, but really has to prove it during this movie, not only to us, but also to a judge. At the start of the movie, Joanna tells ted that she is leaving him. He comes home from work and is very excited about a big account that he just landed, which he has been working on for months. And suddenly his day goes from amazing to terrible, when Joanna drops the bomb on him. She tells him that she’s made up her mind, and is leaving, and he can’t believe it. He thinks she’s kidding at first. He tells her that he will change, but it’s no use. She is already out the door by the time he gets up the nerve to go after her. The big issue here is that Joanna has left ted with their son, Billy, who is only about seven years old. Now ted has never really been the one to take care of Billy before. He is extremely career oriented, to the point where he put his career ahead of his wife, stopped paying attention to her, and that’s the reason why she left. Only things have to change now. Ted goes into work, the same as usual, but now he takes calls from Billy or about Billy, while in the middle of meetings. He is now completely and solely responsible for the boy. It is Ted’s interactions with Billy that really make this movie great. They have some wonderful conversations and moments together, with ted often treating Billy like an adult. That’s just the way ted is, not really knowing how to be a parent. But boy does he try. Ted has one great moment with Billy after another, from the ice cream scene where Billy defies ted, to the park scene where Billy gets injured. That park scene leads to Billy going to the hospital to get stitches. And it becomes a very powerful moment when ted refuses to leave his son’s side and even leans his chin on Billy’s forehead while Billy is getting the stitches. Ted wants to feel the pain with his son. He wants to experience every moment of it with Billy, and maybe it’s because he blames himself for what happened, but more likely it’s because he just wants to be connected to Billy as much as possible. If Billy is going to feel pain, then ted is going to feel it too. It’s something they have to handle together. Aside from the relationship between ted and Billy, there’s also a lot that gets explored here about what things were like between ted and Joanna. One of Joanna’s close friends who lives in the same building as them, named Margaret, comes to see ted. When Joanna left, she left everyone, including Margaret, and now Margaret comes to see how ted and Billy are doing. She is impressed by the way that ted has really turned him around to become a good parent, and she tells ted about some of the conversations that she used to have with Joanna, about how unhappy Joanna was. Margaret separated from her husband just a little while before Joanna left, and ted is suspicious that Margaret might have influenced Joanna to leave him. One day Joanna shows up and asks ted to go out for coffee. The two of them sit there in the coffee shop with Joanna confessing that things have changed for her. Ted is sitting there thinking that maybe she wants to come back. Things have certainly changed for him too, and he is now much more interested in paying attention to other people than he ever was before. Only, that is not what Joanna wants. She wants Billy. She tells ted about how she has been watching Billy from the window of the restaurant across the street, and how she has made up her mind that the boy should be with her. That leads to the trial. I like how the movie doesn’t just jump into the trial but starts with lots of meetings and phonically between ted and is lawyer. One of the first ones is about whether or not ted has to let Billy go and spend a day with his mother. Another conversation they have is about whether or not they are going to play dirty and bring up anything that could possibly help them in the trial, even if it is not the nicest material to be bringing to the surface. They agree to do it, and Joanna’s lawyer plays by the same rules. The trial is pretty great with every main character, including Margaret, taking the stand. The ending is also not the Hollywood cookie cutter kind of ending you would expect. Instead, this movie has a sort of indie feel. It is powerful the whole way through, and while the first half might feel a little lighter, that is where ted really starts to change and figure things out. By the end of the movie, he has put Billy so far ahead of his career that his job has suffered for it. There is a terrific scene where he goes out to get another job and offers the firm a one time deal, take it or leave it, but you must decide right now. That is a very funny and creative scene, especially since it happens in the very next room from where a Christmas party is going on. 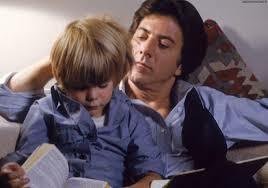 Kramer Vs. Kramer is a truly fantastic film completely driven by the powerhouse performance of Dustin Hoffman. This movie won best picture of the year and boy did it deserve it.